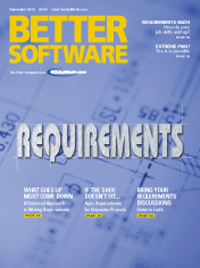 In this issue's Last Word, Dion Johnson calculates your job's worth when requirements are removed from the equation. Every manager has a story to tell. Find out how one management professional tackles a fictional dilemma. The story may be made up, but the solutions are tried and true. In this installment, Michele Sliger tells the tale of the movement of a Program Management Office away from waterfall toward Agile. Writing requirements purely top-down or only bottom-up is risky to say the least. The devil's in the details, and those details are likely to be missed when working from a single direction. What if you could tackle your requirements from both directions by incorporating use cases and user centered design? Learn how balancing your approach to writing requirements can result in more detailed, pragmatic documentation. We're pleased to bring you technical editors who are well respected in their fields. Get their take on everything that relates to the industry, technically speaking. In this issue, our newest technical editor, Lee Copeland, discusses three books that have changed his life and encourages others to seek out literary inspiration of their own. So what happens when interaction designers are put to work on an Agile process? Meet "Dan Means," a system administrator persona developed to represent and emphasize customer requirements. Find out how one development team used him and other personas to blend interaction design and Agile development to deliver a product the customer really wanted. Once upon a time there was an Agile requirements process and an ugly stepsister project. This might sound like the beginning of a fractured fairy tale, but it's a reality for many projects that don't fit the criteria for an efficient, effective requirements process. Language barriers, large teams, and tunnel vision are all things that can turn your project from Cinderella to stepsister. Find out how you can overcome these obstacles and get your team back to "happily ever after." Trying to communicate with businesspeople about requirements can make you feel like you're from another planet. Using concrete examples expressed as storytests to drive the development of a system can help bring you back into the same orbit. Discover ways to introduce this process on your next project. Need to get the scoop on the latest software tests and trends? You've come to the right place. Get one reviewer's opinion of PerlClip. All code is not created equal. Learn from a master of the craft how to spot bad code and mold it into good. Mike Clark explains how to clean up your code clutter by removing duplication. Connect with an expert to learn how to work smarter and discover new ways to uncover more defects. Michael Bolton leads us further down the path to successful critical thinking by teaching us the kinds of questions we should ask to obtain the most useful information.